This week we installed a new small exhibit, Canteen Canvases, outside of the Forbes Theater in the main Museum. The display which will be up through January 2, 2012, features eight handcrafted pieces of canteen and mess kit trench art, including one crafted by Museum volunteer and 5th Air Force veteran, Vernon Main. For the installation, our Exhibit Designer, John Costa, decided to use mirrored Plexiglas for the floors and backs of his custom built cases. The mirrors enable us to spotlight these pieces, which are covered on all sides with etchings, from multiple angles. The mirrored effect is great—but boy, is it a difficult surface to keep clean! 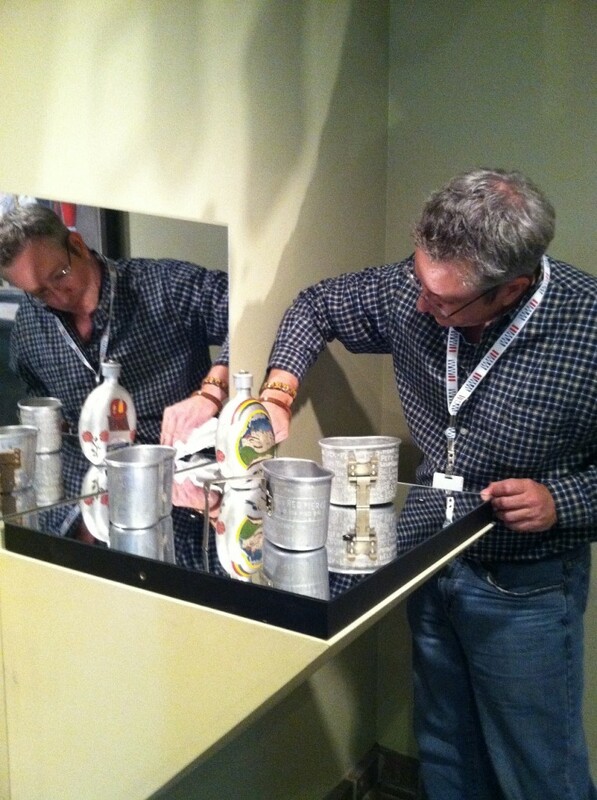 Exhibit Designer John Costa in action! 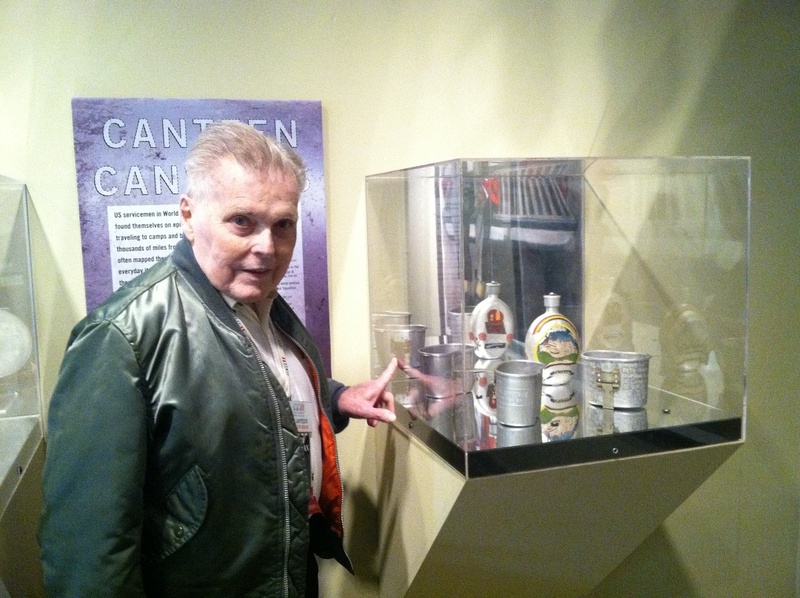 Veteran and Museum volunteer Vernon Main next to his decorated canteen. Wristwatch and Ike Jacket of Cpl. Jim Sandoz. survey the wreckage. In the mud on the ground next to the pilot’s dead body, Sandoz found a Minerva wristwatch. He picked it up and after the war brought it back home with him to New Iberia, Louisiana. 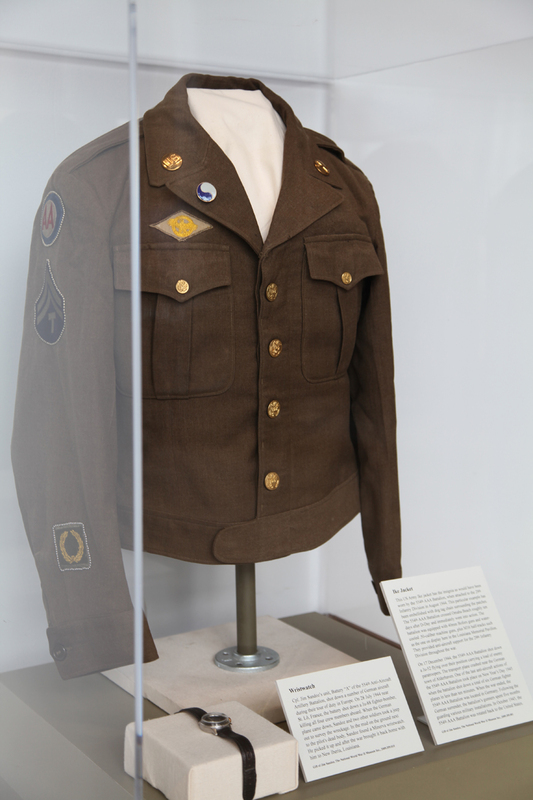 This US Army Ike jacket has the insignia as would have been worn by the 554th AAA Battalion, when attached to the 29th Infantry Division in August 1944. This particular example has been embellished with dog tag chain surrounding the patches. The 554th AAA Battalion crossed Omaha Beach roughly ten days after D-Day and immediately went into action. The battalion was equipped with 40mm Bofors guns and water-cooled .50-caliber machine guns, plus M16 half-tracks such as the one on display here in the Louisiana Memorial Pavilion. They provided anti-aircraft support for the 29th Infantry Division throughout the war. On 17 December 1944, the 554th AAA Battalion shot down a Ju-52 flying over their position carrying a load of enemy paratroopers. The transport plane crashed near the German town of Alderhaven. One of the last anti-aircraft actions of the 554th AAA Battalion took place on New Year’s Day 1945 when the battalion shot down a total of six German fighter planes in less than ten minutes. When the war ended, the 554th AAA Battalion was located in Germany. Following the German surrender, the battalion’s gunners spent five months guarding various military installations. In October 1945, the 554th AAA Battalion was rotated back to the United States. This exhibit at Isidore Newman School’s Reynolds Ryan Art Gallery features 39 of the Museum’s propaganda posters and will be used as an interdisciplinary teaching tool for students of the school. It is our hope that other schools in the area will be interested in this unique model to help students appreciate the lessons and values of World War II from a different perspective. United We Stand! 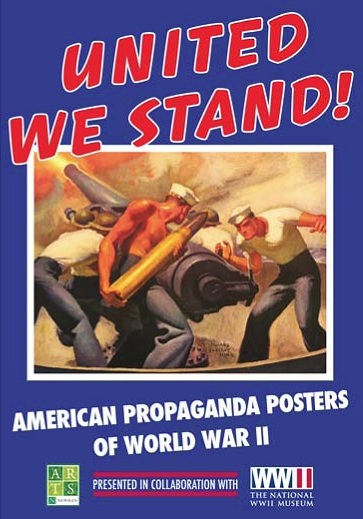 American Propaganda Posters of World War II is sponsored by Museum Trustee and Isidore Newman School 1999 graduate, Brandon Berger, his wife Daphne and the Berger family. For information on this and other Museum exhibits, contact Tom Czekanski at 504-528-1944 x 237. All exhibits are free and open to the public between 10:00 am and 4:00 pm, Monday through Friday. The gallery is closed on weekends and on school holidays. To schedule a gallery tour for students, contact Gallery Director, Kathryn Scurlock at KathrynScurlock@newmanschool.org, or 504-450-3111. I am a retired museum professional and just visited the WW II Museum for the first time today. The permanent exhibits are the best I have seen in many years and I would very much like to know who the designer or designers responsible for them were.